I am ooo-ing and ahhh-ing over these dresses from La Posh Style. I'm dyyyyying to escape this heat and hit the beach this summer, so naturally, I think all of these dresses would be perfect for vacation. I'd throw on some sandals or wedges, a floppy hat, and call it a day as I soak up the breeze in these effortless pieces. So get this. La Posh Style is kindly offering the chance for one of you to WIN a dress of your choice from their store. So go ahead and pick a style, any style. Then leave a comment below telling me which one is your favvvvorite! Choose wisely, because it might just be the one you win! For an extra entry, like La Posh Style on Facebook, and leave a separate comment below! Now go get your dress shopping on! You have until July 11th to enter! i like the flirt or flaunt dress in royal blue! i like La Posh Style on FB; colleen b.
I 'Like' La Post Style on facebook! I'm lovin' the serendipity dress! I LOVE LOVE the Cute in Blue Dress! OOooooohhhhh my, I LOVE the black When In Rome dress!! My favorite is the coral woven dress with belt. gorgeous!!!!!!! I like the "You Complete Me" dress - so cute...and perfect for the 4th of July!! Following La Post Style on Facebook! how exciting! I would LOVE the Vintage Look Dress in Blue! i like the seaform charming dress and the verona tunic in mustard. I love the "A vintage look" dress! hope i win! Loving the Colorful Maxi Dress!!! If this is open to Canadian readers, I love the Vintage Look Dress in Blue!!! what a great giveaway! The A Walk in the Clouds dress in White. Ohhhh my! Pick me pick me! xox! Since I'm preggers I'd hate to pick something I wouldn't be able to fit in. That's why one can never go wrong with shoes! They always fit ;) and I'd l-o-v-e the beige floral wedge shoes. So cute! Annnnd perfect for my shower emsamble. I love the Dazzling Knit Tube Dress. Red and navy blue are two of my favorite colors! I love the florence dress. So cute! Love their style! Might just have to shop their store from now on. LOVING the Caribbean Island Dress and the Verona Tunic in Jade! I lik the Rose a la mode in yellow dress! I would love to own the Two Tone Dress with Front ruffle design. it's super cute!! I also like them on FB! thanks for the giveaway.. love you blog. Love dresses in shop ! I love the When in Rome dress in black, and the Dazzling Tube Knit dress! Seeing these cute clothes gives me a case of vacation brain! Love the You Complete Me dress! Would be perfect for summer. I'm loving the maxi dress and the gold one! Beautiful! I love the Multi Printed Dress! I need the "You Complete Me" Dress! Gorgeous. Give me Florence, baby!!! That dress is supa' fly!!!! Obsessed with the pink number...just sayin. I love the summer stripe dress in red~! Adorable! I liked Posh on FB too!!!! I'm drooling over the Colorful Maxi Dress! I agree with Brooke...I love the Vintage Look in blue! Such an awesome classic summer style. I love the Lively Modish Dress! The attractive polka dot dress. I could wear that baby ANY day. I've got a total of 7 weddings to attend this year and I'm thinking the Blue Bell Dress might just be perfect for a few of the outside weddings. It's too cute. I've 'Liked" La Posh Style on Facebook!! I would love the Special Someone dress in Royal. Thanks for the giveaway! More like LOVED La Posh on FB. i love the Along The Wharf Striped jacket! the lively modish dress melts my heart! so pretty!! I have never fallen in love with a dress online until I saw the stylish-diva-dress. LOVE the leopard dress... there were a few I loved, so hard to choose from such beautiful dresses!!! I also liked the La Posh Style on Facebook so I am only hoping for the best. Thanks for the giveaway! I liked La Posh Style on FB. My fave item is the Multiprinted Dress! I think the ethnic print is gorgeous! Most def the mint floral dress! I love that style and print! Perfect for prancing around this summer! I liked La Posh Style on fb, as well! so many cute dresses...but i love the neutral striped dress! I "Like" La Posh on Facebook! So hard to choose just one... my fav is the In Style dress! Also "like" la posh on fb! Love the "you complete me" dress! I like the caribbean island dress! The Serendipity Dress plz plz plz!!! I love the "Walk in the Clouds Coral Dress"! I love the You Make Me Smile dress-I could wear it now while I'm pregnant and then after! Oh my goodness... I'm head over heels for the Mint Floral Dress! I really really REALLY need to win it! And of *course* I like La Posh Style on Facebook! Come on, big money, Sarah needs that Mint Floral Dress! I love the Walk in the Clouds dress in coral. It's so unique! I like La Posh Style on Facebook as Rose Lariviere. I want that Vintage Look Dress in green!!! Soooooooo excited about this giveaway! I love, love, LOVE the navy "charming empire dress".....so adorable for summer! Also "liked" La Posh Style on FB! THank you!! I love the Summer Days dress! I absolutely LOVE the My Love Embroidered Dress in Salmon! Another awesome pick is the Vintage Look Dress in Blue. I "liked" La Posh Style on facebook under the name Anne Trapani! I loooooove the coral woven dress with the belt! I go to school in Florida so I definitely need a dress like this to cool me down on my way to classes! I love the Mint Floral dress. I love the Beige Secret Garden Floral Dress! It's the floral dress of my dreams! i LOVE the color of the ocean breeze flirty dress. Totally not fair! How can I choose 1 favorite when I looove so many of them?! ;) Okay, I'll give it a whirl with the Dazzling Tube Knit Dress. Too chic! I love the embroidered tunic dress!! SO cute! I liked La Posh on facebook! I have to have the You Complete Me Dress. Liked La Posh on FB! Great give-away!!! My favourite dress from "La Posh" is the "Seaside Maxi Dress": It is amazing and perfect for a walk at the beach! My favorite dress is the mustard yellow dress. While being a fun color, it is also appropriate for me to wear as a first grade teacher. It would make me look professional yet able to have a keen sense of fashion for my first grade loves. so many wonderful dresses to choose from! I am also following them on fb! I love the Florence dress! I can't get enough of the mustard color! LOVE the Flirt of flaunt dress...but really they are all so pretty! what an awesome dress selection. I think i'm in love with that little blue number! THanks for the giveaway! I am head over heels for the Two Tone Dress with Front Ruffle Design!! They are all so beautiful and fun! :) Thanks for sharing the site! They have such an awesome variety of dresses! My favorite is "A Dashing Dress" - perfect for summer! Also liked La Posh Style on Facebook! I'm loving maxi dresses right now and the Colorful Maxi would be perfect! I would choose the leopard print dress!! I love the caribbean dress! Holy moly, I think I might have fallen in love! 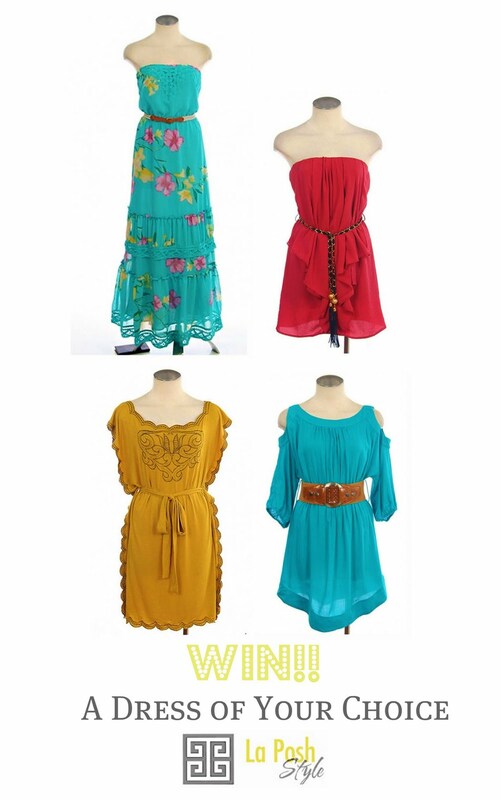 I adore the Splash of Color with Ruffles Dress, and the Summer Days Dress. Gorgeous! I Love the Coral Woven Dress w/ Belt! It's my go-to color this season! I am loving the red tube top dress! Perfect for a stroll in Central Park! Love the mint floral dress! I love the Florence Dress! I love the summer striped dress in red!! I live in the valley too, so it would be the perfect cool, cute summer dress on a hot AZ afternoon! My fav is the you complete me dress! I liked La Posh Style on FB! The aqua leopard print tunic is calling my name!!!! I like the multi print dress. And I liked on FB. Love the classy chic dress! Thanks for the chance. I love the Carribbean Island dress! So summery! I like "A Walk in the Clouds Dress" in coral! I think the You Complete Me Dress dress is the cutest! hey katie! i "like"d La Posh Style on FB. It's sooo hard to pick but I'm super hoping I win the blue dress with cut-out sleeves! i love the "flirt and flaunt" in royal blue....gorgeous!!! ooh la la is spot on. 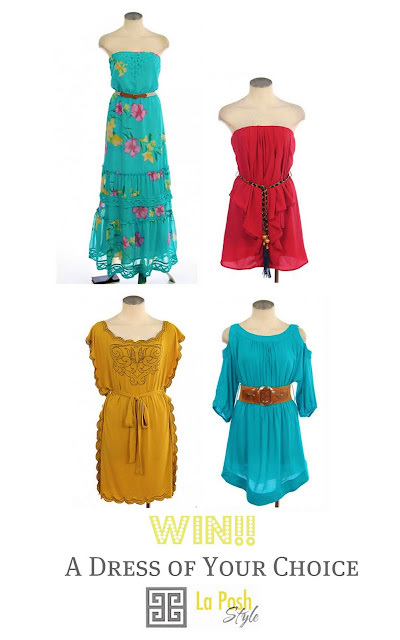 love the dresses and the prices . . my fav would be the barcelona dress in blue. Can't pick just one--love Serendipity, Florence, and You Complete Me! I love the seafoam charming dress!!!! The Ocean Breeze Flirty Dress is just amazing. Love them all! I have my eye on walk in the clouds in coral, though! Oooh, the Beige faux suede ruffle knee high boots! Can't wear them now, but they'd be perfect when fall comes. I love the In Style Dress because it can be dressed up or dressed down. Love the carribean maxi dress... I can wear it whether the legs are freshly shaven or not. But I'd pretty much wear anything on the la posh style site. I love the Ocean Breeze Flirty dress!!! And most everything else on their site!! I "like" La Posh Style on facebook!!!!!! The "You Complete Me" dress is AH-MAZING! I love it and need it in my wardrobe. i like the flirt or flaunt dress! I LOVE the Light Pink Belted Tunic Dress! So cute for summer! I love the brown belted blue dress shown above! LOVE LOVE LOVE! I "liked" their page on facebook! I also liked La Posh Style on Facebook! Thank you! I liked La Posh Style on facebook. you complete me dress! love it! loving the you complete me dress! So cute... the Vintage Look Dress in Blue is adddorable!!! Love the Dazzling tube dress! I also liked them on FB. The seafoam charming dress is by far my favorite!